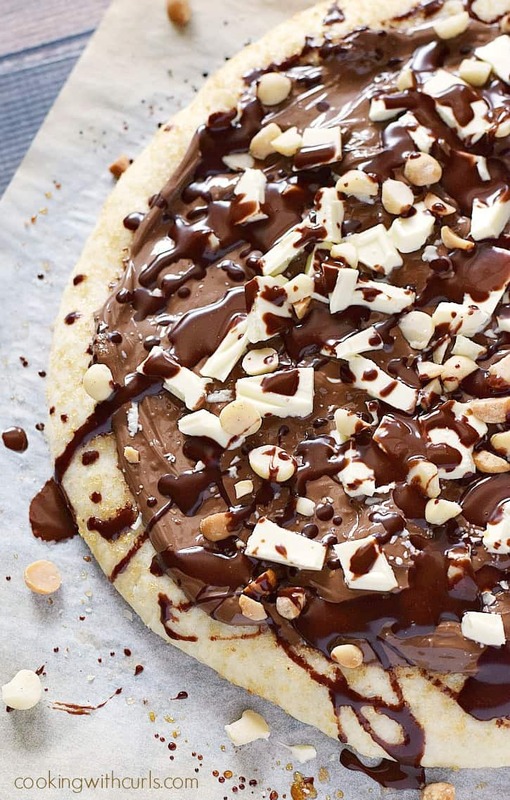 Well I’ve gone and done it now…this Chocolate Hazelnut Pizza is A-M-A-Z-I-N-G! I am finally feeling better and I made a dessert pizza to celebrate. Makes perfect sense, right? Doesn’t everyone create pizzas simply because the sun is shining and it’s been a week since the last pizza was made? No? 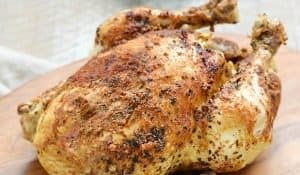 Oh well, you are going to love this creation…..
As always, place your baking stone in the cold oven and turn on to 500 degrees and wait for one hour for it to get nice and hot. I usually make my Homemade Pizza Dough right before I start preheating the oven so they are done about the same time. Roll your dough out on a well floured work surface to form a circle. 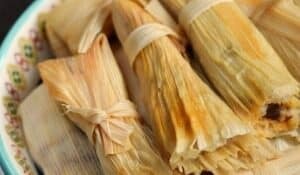 Place on a sheet of parchment paper and brush with the melted butter and sprinkle with sugar…..
Place in preheated oven and bake until pizza begins to brown and sugar begins to caramelize, about 5 minutes….. 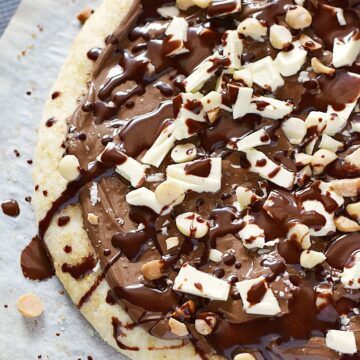 Remove pizza from oven and spread chocolate hazelnut spread evenly over the pizza. Sprinkle white chocolate chunks and chopped hazelnuts over the pizza. Drizzle with chocolate topping…..
Slice pizza and serve. The heat from the pizza and the chocolate topping will melt the white chocolate as it cools. 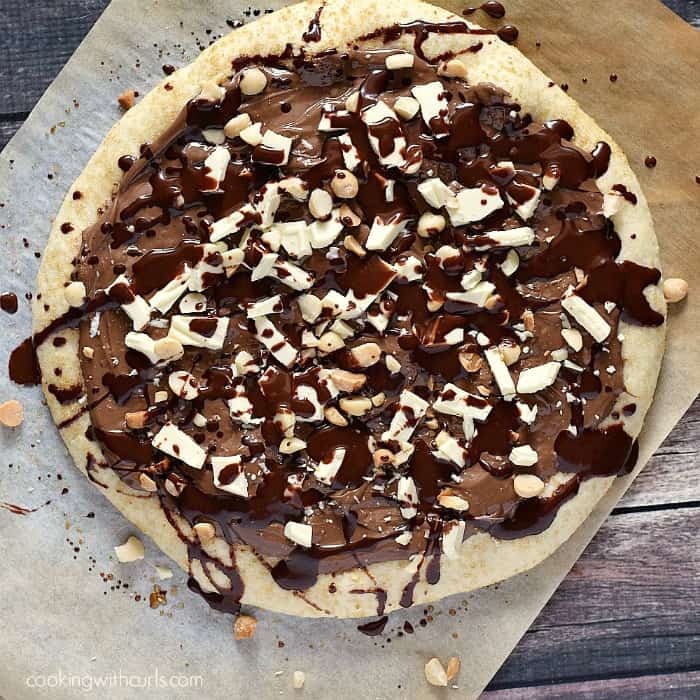 Gooey, chocolaty and delicious Chocolate Hazelnut Pizza is a fun and unexpected dessert that the whole family will love! 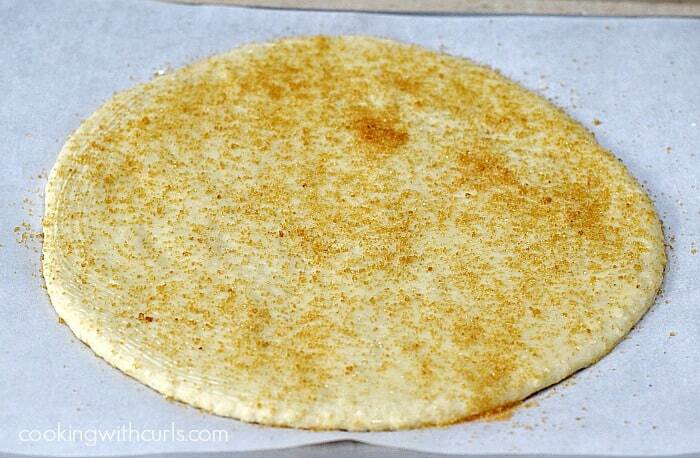 Brush top of pizza dough with melted butter, then sprinkle with turbinado sugar. Place in preheated oven and bake until pizza begins to brown and sugar begins to caramelize, about 5 minutes. 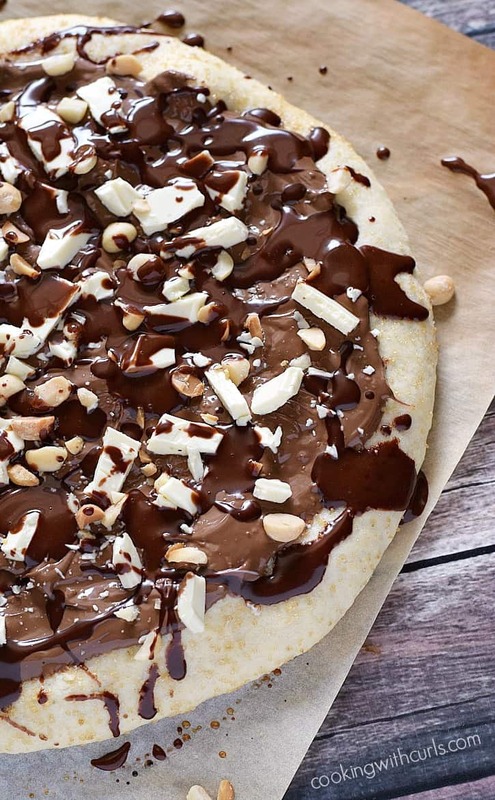 Remove pizza from oven and spread chocolate hazelnut spread evenly over the pizza. 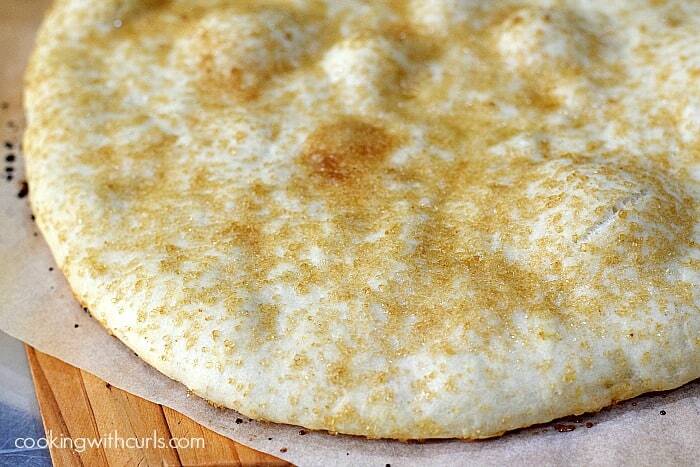 Sprinkle white chocolate chunks and chopped hazelnuts over the pizza. Lisa – this looks amazing! I have to pin this! Hope you are doing well. It was so great meeting you IRL last month! MMM! Absolutely mouth-watering! Thanks for sharing with us at Weekend Potluck. 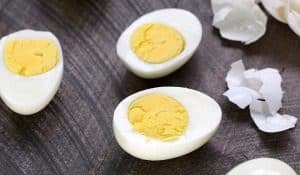 I’ve been drooling over this recipe all week! Dessert pizzas are the best. Especially ones with hazelnut…kind of addicting, that stuff. Pinned!